Ideally this post would’ve come first, but we were doing a bit of experimenting here at the home office while getting up and running and needed some quick content, or at least things that would give you a bit of a feel for what the content mix is going to be here, so first things came first. This week is what we’re considering the actual launch of the blog in that there should begin to be regular updates and a compatible Twitter feed. We’ll see how it goes, but we’ve got some fun stuff planned. At this point you may be wondering who I am and what this all about it. If so, that would make you the first of the many astute followers I hope to have here at the Southern California Golf blog. Besides writing, I’ve spent the summer golfing, traveling, golfing while I’m traveling and networking with those in the golf industry. 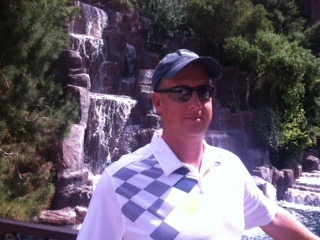 For instance, I went to Las Vegas in August for the West Coast PGA Show and had a blast. Anyway, what I’m envisioning the content being here is a mix of course reviews, offshoots of some of the stories I do about the golf industry here in Carlsbad, topics I find timely and amusing from the golf world at large (see my post about Arnold Palmer) and other musings about daily life on the links in Southern California. At its best, I hope this blog will read like banter on a tee box, just two playing partners chatting it up on the course and talking about the things golfers talk about on the course (course recommendations, playing experiences, equipment, the tour, etc.) while we’re waiting – and out here, this can be awhile – for our next shot. What you won’t find here, such as when I write course reviews, is negativity. This space is meant to be a celebration and exploration of the golf bounty we are blessed to enjoy every day here in So. Cal. Despite having played here now for some 14 months, I still consider myself in a bit of a honeymoon phase with California golf. For all I’ve done, there’s so much more to explore, enjoy and appreciate. That’s not to say I’m not annoyed by slow play and the other issues that impact golf here on a daily basis, but when I write a course review, for instance, I hope it generates positive discussion about the course and doesn’t devolve into dwelling on rates, course conditions, service, etc. There are plenty of places to do that on the world wide web. I’d like to build a little on-line golf community here that embraces what’s great about golf here, because there’s so much that is. And if I can introduce newcomers, or travelers, to some of what’s great here, all the better. I still feel like I’m walking a bit in those golf shoes myself and my natural curiosity about everything golf here is part of what will be fueling the content. If you’re wondering about my game, it’s the best it’s ever been. My time in school, continuing lessons and practice, and capable playing partners have given me a game that will play anywhere. I’m just below a 10 handicap (I’ve been as low as an 8) and have a steady short game, a long game that keeps me competitive off the tee and an iron game that … needs work. The new Mizuno’s I bought and had fitted through school have helped greatly, but I still don’t hit enough greens. I shot 82 (37 on the back) at The Crossings in Carlsbad recently to lower my career low by a stroke. I’m on the hunt to break 80 and will probably document some of that process here as I’ve got some tips. My other goal is to shoot par for nine holes, which I nearly did during the Crossings round. I don’t have a home course, per se. School, my assignments and my travels have provided me opportunities throughout the region to play a number of spectacular public and private facilities, everywhere from Torrey Pines, Maderas and Journey at Pechanga to Marbella, La Costa and Coto De Caza. And I played both Kapalua courses (Plantation and Bay) while in Maui, a trip I most definitely WILL be writing about in the future. – First shot I ever saw in a golf tournament I covered: A hole-in-one. No kidding. – Personal number of hole-in-ones: One. Labor Day 2012, No. 3 at the Vineyard in Escondido. – First PGA Tour event I attended: the 2010 PGA Championship at Whistling Straights, yes, the one with the infamous sand-trap penalty on Dustin Johnson. – Favorite magazine golf piece: Rick Reilly’s attempt to par the Road Hole at the Old Course, published in Sports Illustrated in 1995. This was in his long-form days. SI was my sports writing textbook and this was one of the most impactful pieces for me and probably led to what I’m doing now. More about this in a future post. – Golf motto, especially when I’m having a bad round: There are 100 ways to enjoy a round of golf. Make that 101. I’ll add “Reading about it” to the list and hope to give you plenty of original material here that gives you reason to agree with me. This entry was tagged SoCal Golf Blog, Southland Golf, Tin Cup. Bookmark the permalink.